Steve McClaren has described his job as England's new head coach as "a great challenge and a great adventure". The former Middlesbrough boss replaces Sven-Goran Eriksson and promised changes on his first day in the job. "I'm very excited and can't wait to get started. Looking to the future, I will look to make a few changes and freshen a few things up," said McClaren, 45. "It's going to be different from Sven, totally different. I'm going to do it my way. I will be judged on what I do." And on being asked as to who will replace David Beckham as captain, McClaren said: "Individuals and smaller details we'll get to later on." McClaren was named as manager in May and was Eriksson's right-hand man at the World Cup in Germany. Following England's defeat to Portugal in the quarter-finals he took a two-week break in Mauritius during which he admitted to growing impatient at the prospect of becoming national coach. "It really hit home when I was appointed, at that press conference, but the period since then has been a bit of a vacuum," he added. "I've been itching to get at the job and I'm delighted that period is over now. "You have to assess the players first of all, and to have a good relationship with the clubs, so we will be speaking to their management, coaching staff and medical staff. "The aim is to try to bring the whole nation closer together, to bring the England team closer to the clubs and the fans. "The fans, as we've seen, are fantastic and we have to build a team that can achieve something and give the fans something to be proud of." Overseeing preparations for a friendly against Greece on 16 August will be among McClaren's first duties and he is set to watch Manchester United and Tottenham in pre-season action. 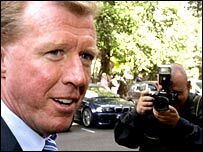 McClaren will also finalise details of his backroom team before making an announcement on 11 August. Former England coach Terry Venables is expected to be given a role but Alan Shearer has rejected the offer of a coaching spot in the new set-up. Bill Beswick, McClaren's sports psychology guru and assistant manager at Middlesbrough, is also expected to be given a backroom role. Beswick left the Teessiders at the end of the season - after their Uefa Cup final defeat by Sevilla. The futures of England coach Sammy Lee, goalkeeping coach Ray Clemence and England Under-21 boss Peter Taylor also have to be determined. McClaren will name his first England squad on 12 August for the Greece game. Those players will meet up in Manchester on 14 August and McClaren is expected to delay the announcement of his new captain until he has seen the candidates face-to-face. Chelsea's John Terry and Liverpool's Steven Gerrard are the front-runners, with Gary Neville and Rio Ferdinand of Manchester United the outsiders. While McClaren was late for his first day in the hot seat after his flight from Teesside to London was delayed, his boss, FA chief executive Brian Barwick, arrived earlier than usual having interrupted his holiday to greet the new man. Barwick said: "It's a new chapter in the life of the England national team. "His first challenge was to find a coffee machine, his second challenge was to find my office and his third challenge - the real challenge - is to build an England team that we can all be proud of. "I'm happy he will be able to do that." McClaren will be familiar with his new environment, having worked under Eriksson during the Swede's time in charge. He has been on the FA payroll for the last five years but has only worked on a part-time basis around matches and never from the FA's Soho Square headquarters.